Our reply: Make one! With your class! Plywood, printer, wheatpaste is all it takes. 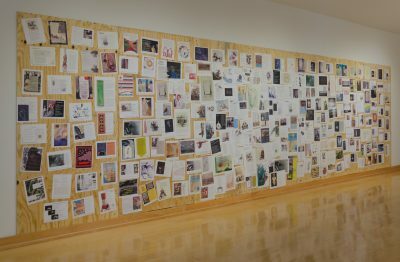 You could add student-made broadsides and new publications to the wall over time. Let it become not an exhibit, but a living, growing experience. The layers will add up, thickening to a sculptural element. Plywood has a few different “qualities” — you don’t need to buy the fancy stuff for this. A bit of a rough edge adds to it. 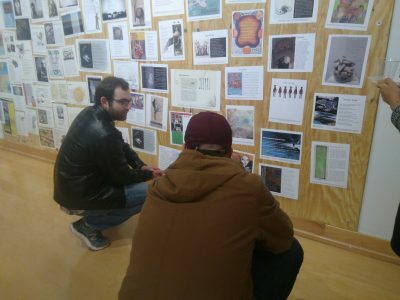 It took seven (7) full 4′ x 8′ sheets to display all of the 250+ broadsides. That’s roughly 37 letter-sized broadsides per sheet. Simple screws or nails will fix the plywood to the wall. If you don’t have baseboards, you might want to make sure the bottom of the plywood is a few inches off the ground, to allow for mopping. Any copy shop will print the broadsides. Download as many as you want to print. We do, in our offices, have pdf files of each year’s broadsides (so, for example, all the 2018 broadsides in one single pdf file). If you’d like a file, just contact us. We’re glad to share. Boil the water in a saucepan (you might want to use a pan you don’t mind dedicating to this task, as cleaning will be difficult… not impossible, but difficult). Put 3 Tablespoons of water into the flour, and mix. Then pour that mixture into the boiling water and stir stir stir. The mixture will want to bubble over — watch out for that. Constant stirring also gets rid of any clumps of flour. Boil and stir for 2 minutes. Take the pan off the heat, add the sugar, and stir until well mixed. Pour into the container you want to paste from — the mix will keep for a few days. It’s simple, cheap, and amazingly sticky. Make sure you clean any brushes or pans before the paste sets. For a larger batch, which will probably be necessary for an entire plywood panel, use 12 c water, 6.5 c flour (mixed with 6 c cool water), 4.5 c sugar. We moved from a paintbrush to a foam roller after a bit of experimentation. A wet sponge also smoothed things out. Brush the wood with wheatpaste before AND after putting up the broadsides. 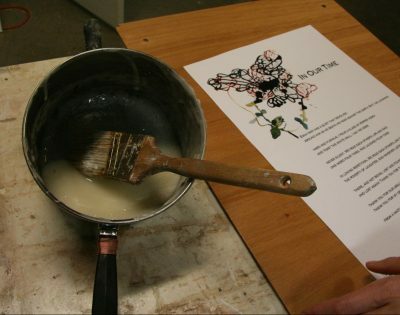 Lay down a thin, smooth layer of wheatpaste with a brush or roller. Set your paper onto it, then brush again. 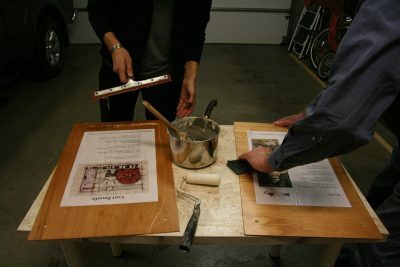 Use a squeegee to smooth out the paper, flattening any ripples or bubbles that appear — but don’t squeeze off too much of the paste! There will be drips. It will get messy. Make sure you’ve got a drop cloth and aprons/old shirts. 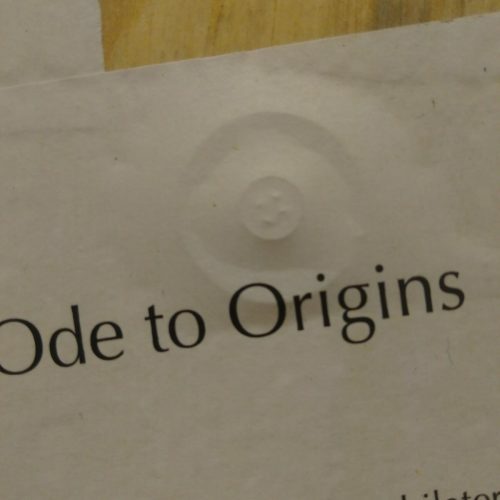 A washer and screw rise up through the wheatpasted broadside. Don’t worry too much about “perfection.” If a corner curls up or a bubble bulges, that’s fine. 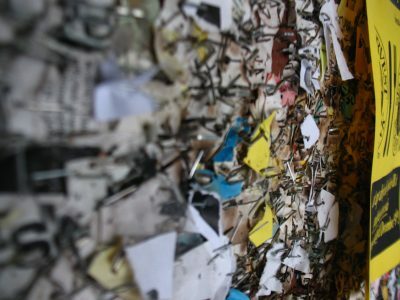 The point is beauty in chaos: seeing poetry not as something fixed and perfect, but as part of the messy, communal world. Let the papers overlap. Let the hardware affixing the panels to the wall show through. We’ve included a one-sheet pdf with the basic instructions at the top of this page. We’d love to show examples of your “Lit Walls” here to inspire others.